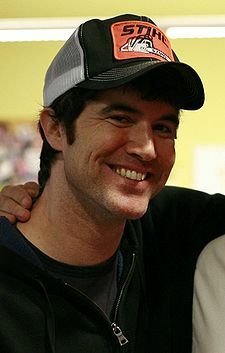 He co-founded the social networking website MySpace in 2003 with Chris DeWolfe. Anderson was previously president of MySpace, and is now a strategic adviser for the company. Because newly created MySpace accounts previously included Tom as a default "friend," he has become known as the default picture of MySpace. As of February 2010, Tom's profile has over 12 million friends. In 2003, working for eUniverse under the purview of Brad Greenspan, he and a few other eUniverse employees set up the first pages of MySpace, and the site grew from there. It is currently one of the most popular social networking websites in the United States (listing consistently among the top ten on Alexa Top 500 Global Sites, after its main competitor, Facebook). He briefly appeared in the 2009 American drama-comedy Funny People starring Adam Sandler, Seth Rogen and Leslie Mann. American Idol Finalist, Scott MacIntyre, wrote a song called "I'll Take Tom" on his debut album "Heartstrings". The song is written about a MySpace relationship.